There’s a really cool project underway that when complete, will result in a guitar music (and player) documentary film. 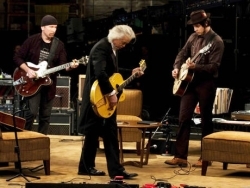 The project involves a global search for six guitar players who have a story to tell about themselves, their guitar, their music, or better yet… all of those subjects combined. 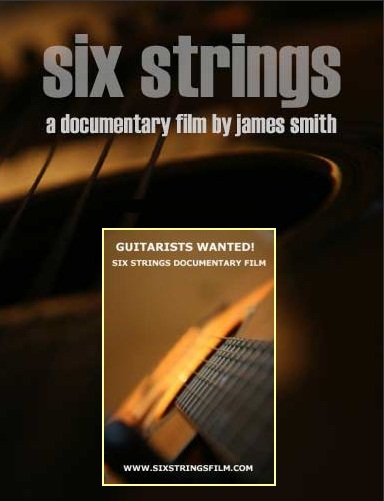 “I am a film director and writer based in London, UK and am making a documentary film called SIX STRINGS about one of my passions: guitar music. My aim is to deliver a superb film and with the help of my production team, market it to film festivals around the world. I am searching for six guitarists from around the world who have incredible stories to tell. They will form part of the documentary and may have the opportunity to contribute to the music within the film. I am looking to find passionate people who maybe have developed a unique playing style or have an incredible story to tell about guitar music – how it transformed or changed their lives and more about the mystique and influence of the instrument – the more extraordinary, heart rending or radical, the better! Guitarists can submit their story (in 100 words) and include a link to their website for an opportunity to appear in the film. The film is being funded by a crowdfunding business model and there are many ways for people to get involved and help out on this site. I hope you will follow the journey and become involved in the making of this film and to promote the music of the beloved guitar. [CLICK HERE] to be re-directed to the official web site.